Exploring a city that you haven’t visited before is one of life’s great experiences. Exploring it like a local, well, that’s even more amazing! When it comes to doing it how the locals do however, there are so many questions – Where do people eat? What do they drink? Where do they go to enjoy themselves? How do they have fun in their city? What are the places they like to visit? If you wish to know how the citizens of Athens do all this, then read on! 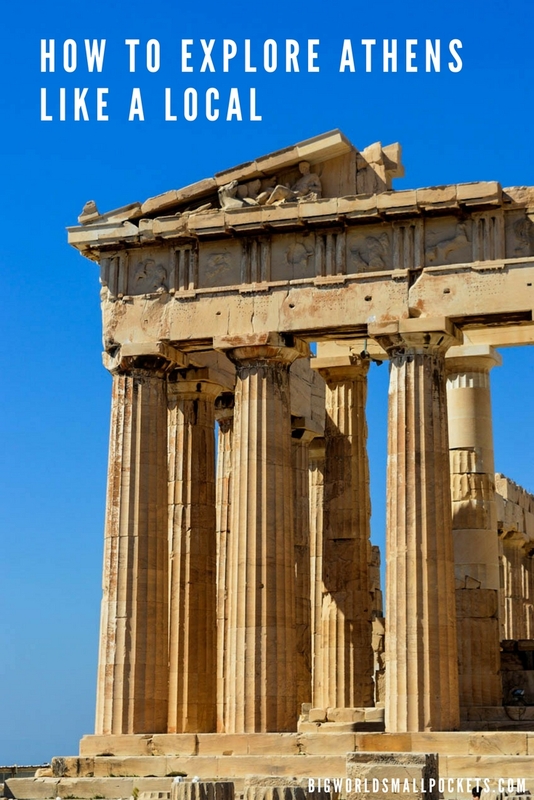 Well, with the help of Greeking.me, a local Athens tourism agency I’ve managed to get all answers and learn exactly how to explore the best of this amazing Greek city like a local, so that you can too. This article was written in collaboration with Greeking.me – winner of the 2017 Exclusive Tour Operator of the Year. A great way to get your time in Athens off to a flying local start is to explore Monastiraki, and the wider area around Athens’ iconic Acropolis, as part of a morning stroll. This section of the city is largely pedestrianised, so many locals will also be out enjoying a walk here in the day, as well in the evening. 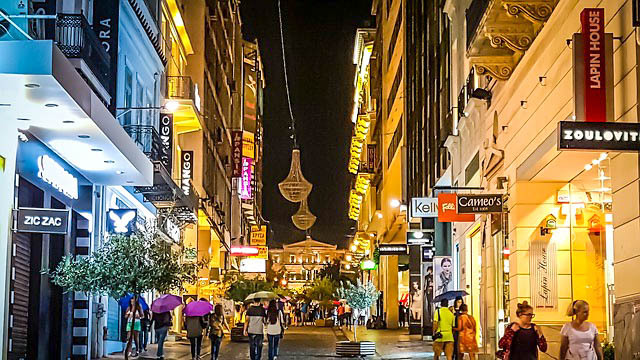 A very common route for local Athenians, who want to stroll here while chattering with friends, starts from Monastiraki square and then heads out to Thissio either through Andrianou Street or through the flea market of Ifestou Street. If you choose to take Andrianou Street, you can admire the monumental temple of Hephaestus which is located on your left. When you reach Thissio, there are then two options for your walk. 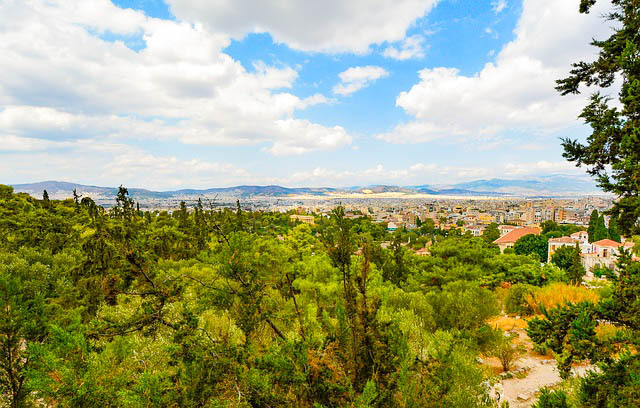 Either you can head straight along the pedestrian footpath to Kerameikos, or you can turn left and explore the most popular footpath of Athens – that which connects Thissio with the Acropolis area. Kerameikos is very popular with the city’s young people, as there are now a lot of bars and nightclubs located here. If, however, nightclubs or bars aren’t high on your agenda, then the footpath to the Acropolis is the more beautiful route to take. 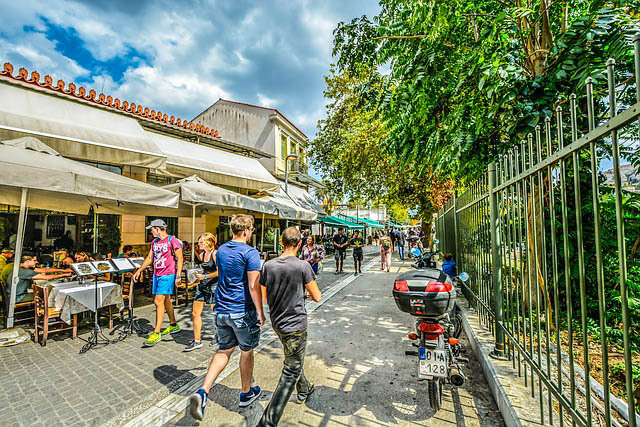 Another great spot to explore on foot in Athens is Apostolou Pavlou Street, a place where many stallholders sell handmade jewelry and other beautiful handicrafts. Probably the best thing about this route however, is an area located in the middle that is covered with little rocks! It sounds strange, but this is a favorite local place in Athens. The name of the site is “Vrahakia”, meaning little rocks in Greek, and if you climb it and walk for about 5 minutes, you will be treated to a unique, panoramic view of the city. Athenians of all ages go up to Vrahakia to hang out and enjoy a delicious ice-cream or cold beer. 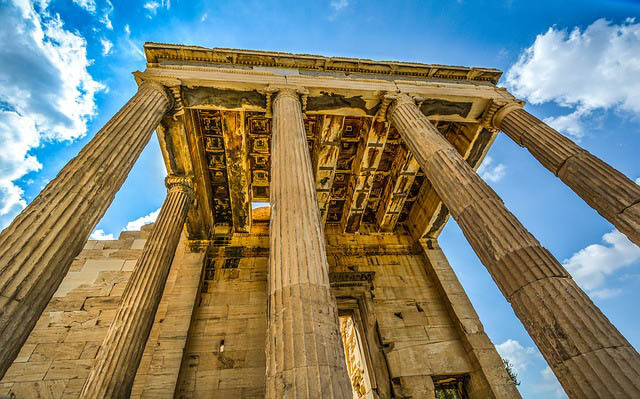 Besides relaxing, Vrahakia is also a great place to snap some awesome pictures of the Parthenon – the temple which the ancient Greeks dedicated to goddess Athena and one of the most famous landmarks in the city. Don’t worry if climbing isn’t your cup of tea however, there is another route you can take up to Vrahakia that will allow you access from the other side of the hill – just walk a few streets through the Roman Agora. And don’t forget, the beauty of a city really is only revealed when one walks streets most tourists don’t. After all that walking, you’re bound to feel a bit peckish, so make sure you don’t miss out on some local Athenian cuisine while you are here. If you want to keep exploring the city and getting a local taste for things, then don’t bother going to a restaurant. Instead, the renowned souvlaki is the best thing for anyone who wants to eat a quick lunch on the move. If food is your thing and you have some free time in the afternoon, then a great activity you can enjoy in Athens is participating in a Greek cooking class. Teamed up with a trained chef, you’ll easily learn to cook like a local as you uncover the secret flavor combinations and cooking techniques that give Greek cuisine its delicious character. If you’re still hungry when the sun goes down, then join the locals of Athens by heading out to a taverna (traditional restaurant) to taste some authentic Greek food. The Greeks love to enjoy themselves and many tavernas have traditional live music concerts on Friday and Saturday nights. If you are lucky enough to find one that does, you may also see people local dancing along. In this case, don’t hesitate to join them, they will enjoy it as much as you! LOOKING FOR CHEAP TRAIN & BUS TICKETS IN EUROPE? When it comes to the quickest and easiest way to book train and bus tickets across Europe, look no further than Trainline. Offering the best prices, with a handy journey planning feature and live departure updates, this is my one-stop shop when it comes to organising all my Europe adventures on a budget. There is plenty of nightlife to enjoy in Athens, but if you really want to experience this city like a local, then going out to a nightclub or bar is probably not the thing to do. Athenians tend to prefer small places where they can talk while eating and drinking, rather than crowded places where they can only drink and dance, so instead of hitting the town why not head out for a rakomela instead. Rakomela is a traditional drink made from warm raki with honey and most likely served at a mezodopolio. A mezodopolio is a kind of small tavern which offers wine, or typical Greek beverages such as ouzo, raki, tsipouro, rakomelo, accompanied with little side dishes similar to tapas. Visiting one of these is a much more traditional way to enjoy Athens after dark and the neighbourhood of Psirri is an ideal place to find a great local mezodopolio. Another option for seeing the best of this city after dark is to join a night walking tour in Athens. As part of this, you will stroll through the city’s streets admiring the illuminated edifices of century-old ruins and looking for the pulse of the nightlife. 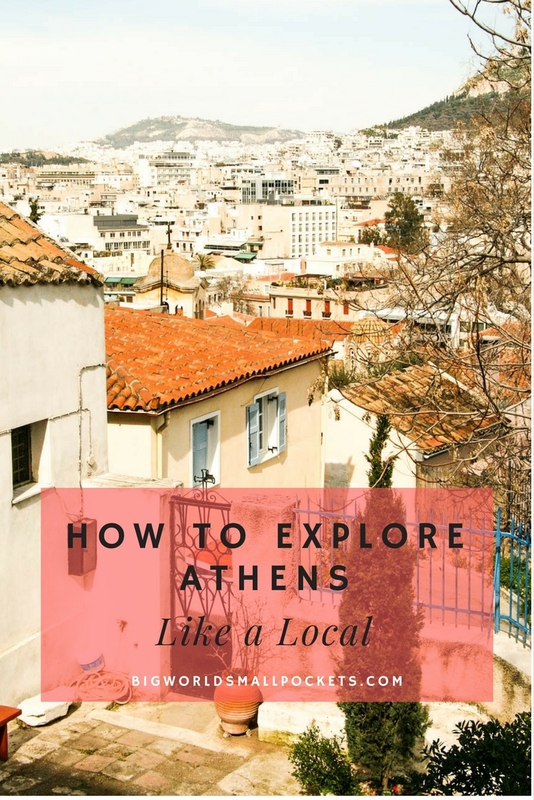 Engaging local tour guides will give you a very genuine perspective on life in this city and will certainly show you all the best spots the people of Athens like to go. 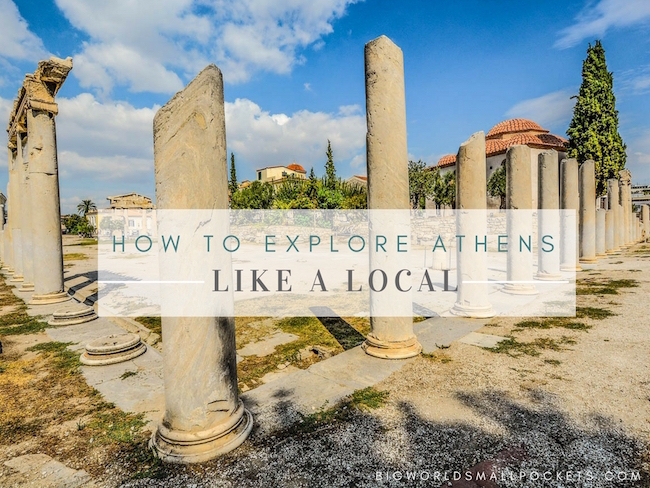 So hopefully that’s given you some great ideas about how to explore Athens like a local in just one day. If you still have more time to explore the city, then there are plenty of other things to do in Athens even on a tight budget, so don’t limit your time here! Exploring the places in Athens where the locals go, along with the very well-known attractions, is something that you won’t regret and soon, you’ll get a real feel for exactly what being part of this amazing city feels like! Hi Stephanie! Love your tips about Athens. I’m the founder of a new non profit here running free events in English for Athens visitors. I would be very happy if you take a moment to see what we do and consider adding it to list. Best wishes and keep on helping the explorers!